KPR offers VCI poly and regular LDPE (low density polyethylene), Custom HDPE (high density polyethylene) and regular LLDPE (linear low density polyethylene) film, co-extruded and specialty grades of industrial flexible packaging. LDPE is lightweight, flexible and offers excellent chemical properties. HDPE is slightly more rigid than LDPE and it provides higher tear strength, less stretch than conventional LDPE films. It is often used at very thin thickness of 0.70 mil to replace VCI paper and other forms of "inter-leave" materials. LLDPE is a new variety of LDPE that offers improved draw-down sealability and strength for certain applications. We provide our customers with a variety of basic FDA compliant types of LDPE, plus other specialty resins such as co-extruded VCI industrial packaging, biodegradable poly (plastic) depending on customer needs. Provide total multi-metal corrosion protection in general usage polyethylene, shrink, static-dissipative or static-shielding film. Application is simple - just wrap or seal your products for immediate and continuous protection during storage, transit or overseas shipment. VCI films offer dry protection, eliminating the need for cleaning or degreasing, and virtually do away with rust claims. These films are recyclable, non-toxic and are transparent for convenient product identification and inspection. The first step in manufacturing is the extrusion process, where raw resin is transformed into film. Our blown film extrusion lines can produce flat tubing, gusseted tubing, single-wound sheeting. J-sheeting, centerfold, and other configurations. We can add color concentrates, VCI corrosion inhibitors and other specialized additives such as static dissipative, VCI and ultraviolet (UV) inhibitors to exactly match your individual needs. We are capable of linear low blends up to 100%. 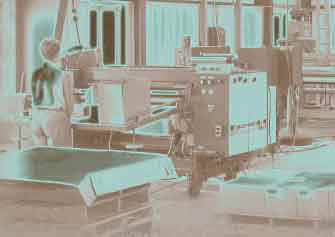 Sizes range from a 1" (2.5 cm) minimum layflat width up to a 100" maximum width depending on film configuration and mil. Our mil thicknesses range from .00075 to .010 (.019-.25 microns). Our converting department the film is made into bags, sheets or shrouds in a wide variety of sizes, shapes, styles and colors for packaging metal parts or food, clothing, hardware, courier pouches, furniture, magazines or just about anything you require. Specialized tooling and several extruding plant locations are available to manufacture unique bags such as V-sealed contour, or your own custom design. Many different shapes and sizes of holes can be punched for venting, hanging or carrying your products. We are well equipped to manufacture the reinforced handle, draw tape handle and the popular bag-on-roll and wicket bags. This department solves your packaging requirements with creativity and experience. Our specialized extruders can provide some of the most appealing packaging available. We can print materials from 4" (10 cm) up to 44" (112 cm) wide, one to three colors, and four colors from is available on many different configurations. By using various available machines and varying printing techniques we can obtain numerous shading effects as well. VCI (Vapor Corrosion Inhibitor) film provides excellent corrosion inhibitor packaging for ferrous and non-ferrous metals in one simple step. It is as easy as putting your clean, dry product in the VCI package. 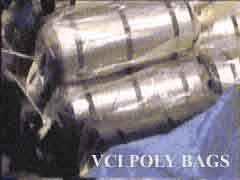 VCI packaging eliminates expensive and messy rust preventatives, desiccants, removal labor costs and expensive regulated waste disposal costs. Our products do not contain any hazardous ingredients, metals, amines, phosphates or chromate's. The slow release vapor action protects the exterior as well as hard-to-reach interior surfaces. It is self-healing and will provide long-term protection for storage and overseas shipment. VCI film is transparent - your parts are easily visible through the film for easy identification and inspection. The film can be custom printed for further identification.